What does it take to move a 1-2 ton animal? Conservation efforts often mean translocation. It is sometimes in the best interest of re-population and survival to move animals into better locations. For example in Assam, India, the India Rhino Vision 2020 program aims to attain a wildlife population of at least 3,000 greater one-horned rhinos in the state of Assam by the year 2020. 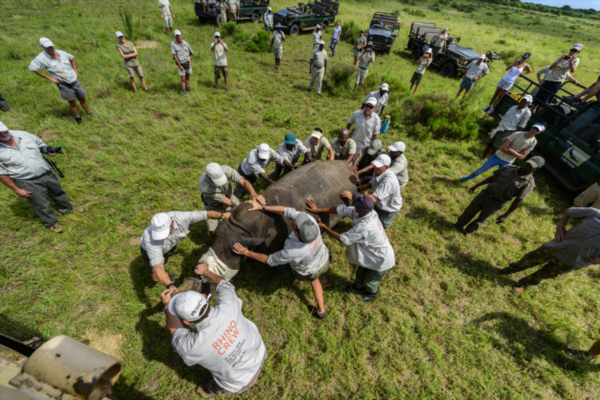 This goal will be achieved by translocating rhinos from areas of high population density to new habitats, where effective protection programs can be put in place. *followed up with waking them, and careful monitoring of their health thereafter. 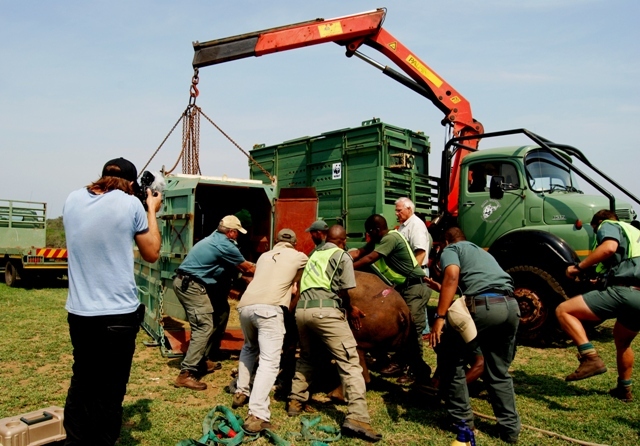 Logistics, practical preparations, bureaucracy, transport and funding have to run simultaneously with preparation of the rhino to undertake the journey. It is a huge and delicate undertaking, and can take considerable time to put together. Then there is the health of the animal to consider. Whenever any animal is sedated there is a health risk from the anesthetic, there is possibility of injury in transport, and the stress alone is a danger. Rhinos have died from the move. Of course there have been less than typical moves as well. 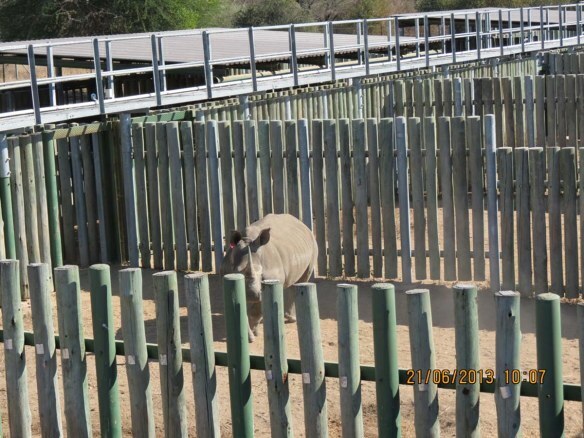 In 2009 three black rhinos were moved from a Czech Republic Zoo to a Mkomazi sanctuary. It took 2 years of planning and a Martinair 747 aircraft to make the 6,400 mile move. Perhaps one of the most misunderstood photos: the’ flying rhinos’, is yet another method the WWF has taken in moving the second largest land mammal. 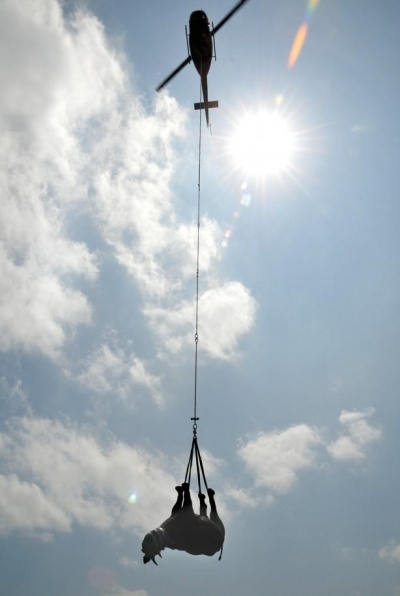 The tranquilized rhinos are suspended from their ankles for a short journey by helicopter to an awaiting vehicle. This is a quick and efficent way to remove them from inaccessible areas. Any way it needs to be done-desperate times call for desperate measures. After all, there are only so many ways to move a 1-2 ton animal. It is a shame she lost the calf, without a doubt. Even in ground transit there is a risk of stress and injury within the ‘crates’. It is also always a balancing act, how horrible when in trying to SAVE the rhino from poachers, they are inadvertently lost. I am still misunderstanding this photo and I want to understand. How can this be OK? It seems so risky . . . can their joints take this? Their organs? I can also see how a vehicle transport would be horrible too, but necessary. Just trying to understand . . . do you have more information? Check this out. It is sponsored through WWF (World Wildlife Fund). What am I checking out? Nothing came with your reply. Thanks, that helped. I have better understanding. And thanks for your blog. It is great. Cool. I can get why transporting the rhinos to a safer place is of the direst necessity. But staying on top of the best way to do it is a good idea. I was working at the LA Zoo when the last California Condors were brought in. The capture techniques were not always successful (I know at least one bird died) but ultimately it was what needed to be done. Probably the hullaballoo from the public kept people on their toes too.